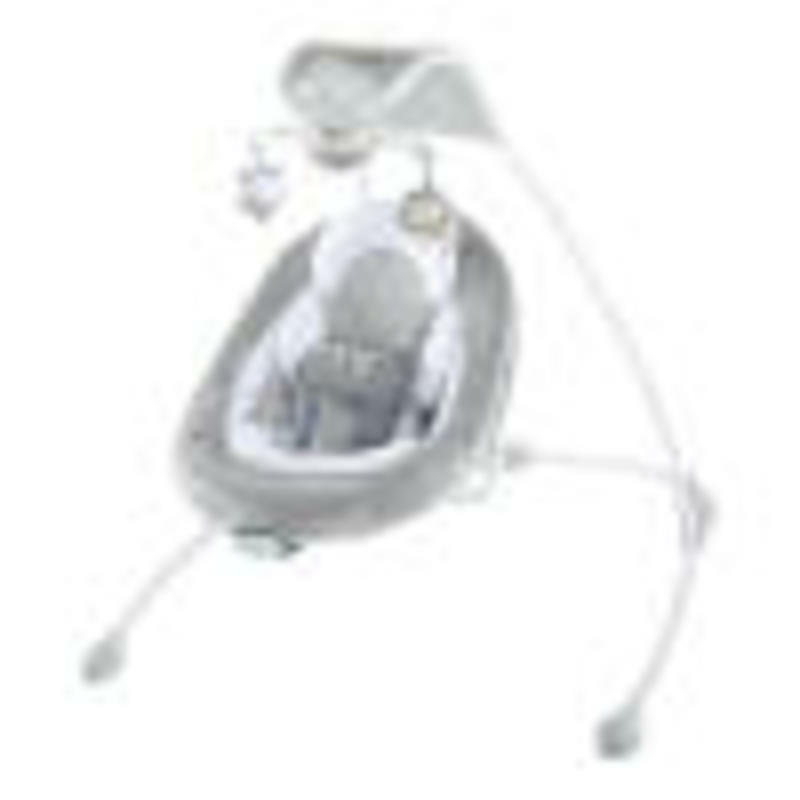 DreamComfort InLighten Cradling Swing - Braden is rated 4.6 out of 5 by 14. Comfort is in full swing. With DreamComfort fabric technology from Ingenuity, your baby can rest easy in a cooler and more comfortable space. This baby swing offers security for your little one, with 180° rotation so your baby is always in sight. The vibrating movements help soothe and calm — meaning you get a few more hands-free moments while your baby gets some rest. Plug in technology saves money on batteries while you and your infant enjoy 6 swing speeds that sway in 3 different directions. The extra quiet motor makes swinging peaceful. When you need entertainment, optional smartphone connectivity can play your favorite videos and a light-up mobile dangles 2 plush toys. The foldable design is lightweight with wheels that make it easy to transport from room to room. Throughout your day, keep your baby calm in cooler comfort. Dimension (in) 35.7" x 34.3" x 41.1"
Seat pad and headrest - Machine wash with cold water, gentle cycle.Frame, toy bar, and toys - Wipe clean with a damp cloth and mild soap. Do not immerse toys in water. Rated 1 out of 5 by Chuck from The Worst Swing We registered for this swing after reading several reviews of many different swings. We were thrilled when we received it amongst the other Ingenuity items gifted to us. The overall look and functions seemed great. First I was disappointed that the built in music times out after about 10-15 minutes with no option to adjust it. I looked past it for a while until after 2 months of lite use the Carousel broke and will no longer spin. Let's hope they stand by their product and make this situation right. My daughter is less interested in the swing now. Rated 3 out of 5 by Krugglybear from Not quite what i expected Well I have to say I am a bit disappointed in this swing. We went back and forth between the MamaRoo and this swing. We ended up choosing this one for our registry due to the multiple options for use (swing and independent rocker), but once it arrived, I was not impressed with the swing portion. I followed all of the guides for building and even watched some youtube videos to make sure I wasn't crazy, yet the swing seems to only have one swing speed! No matter what I do the swing only just barely swings side to side. I've wiggled cords and tried different plugs with the same result. Honestly I cannot recommend this one. I wish i could. The idea is great, but the execution seems a bit poor. Rated 5 out of 5 by sjshapiro from Love it We love this swing. We just received it today and I put it together in a cinch, maybe 15 minutes. It is so cute and soft and the birdies are adorable for baby girl who is due to be here next month. For anyone who has stated they have AC adapter issues or that theirs required batteries to work, make sure the two plugs at the base of the swing (by the back foot) are pushed together tightly until they click, otherwise it will not turn on! Not having to use batteries was one reason we chose this swing and it works exactly as expected. We can't wait to use it for baby! Rated 5 out of 5 by Rebekah from I love this swing!!! I LOVE THIS SWING!!! It’s quiet and compact. My son loves it as well. Rated 5 out of 5 by Rebekah from I love this swing!!! I LOVE THIS SWING!!! It's quiet and compact. My son loves it as well. Rated 5 out of 5 by acbsktbll from This is worth EVERY SINGLE PENNY This isn't my first rodeo when it comes to baby swings and boy do I wish I would've had this one for my other children. I will keep this review short and simple since as a mom I know we don't have all the time in the world to read this so here it is. Pros: 1) IT PLUGS INTO THE WALL! - Can we just let this soak in for a second? I can't tell you how many batteries I went through over the years and they always seem to die at the most inconvenient time. 2) It has a secure harness system which made me feel super comfortable when I strapped my daughter in. 3) You can move the swing seat into 3 different directions which is great since my daughter prefers different swings for different moods! 4) Machine Washable! The fabric on the seat comes off easily so you can toss it in the wash when it gets messy. 5) Converts into a rocker - now we haven't used this one much yet but I have a feeling as the weather changes and we are moving outside more this will be very handy! 6) Lights and music add-ons! The music alone has saved me through the witching hour so far! Rated 5 out of 5 by Danbaby523 from All the bells & whistles My son loves his DreamComfort InLighten Cradling swing. The seat is a great size, which leaves a ton of room for growth. The fabric itself is not only easy to wash but very cozy and made with excellent quality. Not only does the swing recline, it’s swings in a couple different motions which is a plus for us being that my son loves swinging side to side instead of back and forth. The simplistic decor of it fits in perfect in our home. It does take a up some space though. The lights, toys, vibrations, and music truly complete the swing. It’s a must have in our home!